Henry Clay Frick was the most hated man in America. Born in western Pennsylvania to a Mennonite family, he formed Frick & Company, which produced iron coke, when he was only 20. 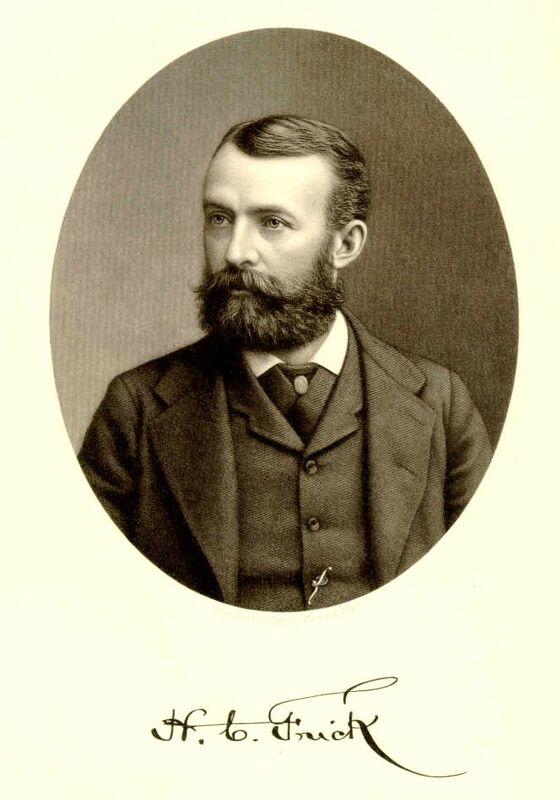 During the financial panic of 1873, Frick bought out his competitors and allied himself with Carnegie Steel. By the age of 30, he was a millionaire. Frick was brilliant and shrewdly focused on the bottom line. Not long after the horrors of the Johnstown Flood, his terrible reputation was solidified in one of the ugliest chapters in the history of American labor. In 1892 after a strike was called at the Homestead Plant owned by Andrew Carnegie, Frick brought in Pinkerton Detectives, a private security firm that acted as mercenaries for hire. A vicious battle broke out with the striking workers. After 12 hours of intense fighting, three Pinkertons and seven strikers were dead. Though Carnegie and Frick collaborated on all decisions via telegraph, Frick became known in the press as "the most hated man in America". On July 23, 1892, an anarchist posing as an employment agent for the strikebreakers tried to assassinate Frick at gunpoint. The bullet hit Frick in the shoulder and a deputy sheriff arrested the gunman who was sentenced to 22 years in prison. Frick was back at work within a week and continued expanding his coke and steel empire for another decade. He warred with Carnegie who eventually sold his shares in a company that Frick would manage after it was purchased by J.P. Morgan. That company became U.S. Steel. By 1905, he retired to New York where he focused on his art collection for the last years of his life. Knowing the collection would eventually become part of a public museum, Frick had a strong desire to improve his public image and establish a more virtuous, refined legacy. For the first decade, Frick lived in the opulent Vanderbilt Mansion. Before his own mansion could be built on "Millionaire's Row", he had the beloved Lenox Library building destroyed. Later he spent $5 million on the mansion with the intention that it become an art museum for the public after he and his wife had both passed away. Legend has it that he told his architect to make Andrew Carnegie's mansion on 91st Street and Fifth Avenue look like a "miner's shack" in comparison. Upon Frick's death in 1919, the public learned that the house would become a public museum. Adelaide, his wife, passed away in 1931. By the next year, work began converting the mansion into museum. The museum's covered portico which serves as the hub of the museum today was the largest addition. Prior, the area had been a covered driveway. When the museum opened in 1935, the press and public were stunned by the extraordinary treasures on display. People quickly forgot about Frick's nefarious career and his extraordinary art collection became his legacy. Today the Frick Collection is considered one of the best art collections in the world. Frick was a major figure in the "race for the great masters" and acquired major paintings by Rembrandt, Vermeer, El Greco, Bellini and Turner. Though the museum is not a house frozen in time, it is easy to imagine Frick living in the mansion at the height of the Gilded Age. Here are 10 must-see works of art at the Frick Collection. Tuesday through Saturday: 10:00 a.m. to 6:00 p.m.